Over the years, many donors have made the commitment to the Missions in a regular but profound way: they are Monthly Donors. They receive a calendar of monthly envelopes and return them to us with contributions large and small. By giving a regular gift, our Monthly Donors help missionaries around the world proclaim the Gospel. We hear from missionaries with the same regularity as donors; they share stories and pictures of ongoing service to others in Christ’s name. Recently, we heard from Fr. Sunder Ery. As parish priest for Holy Rosary Church in Porumamilla, India, he is responsible for all 20 Village Mass Centers that come under his parish jurisdiction. Daily, Father visits them to celebrate Mass and give catechetical instruction. Because of the extreme poverty, Father provides many locals with transportation to and from these lessons; he also must coordinate meals for the elderly. 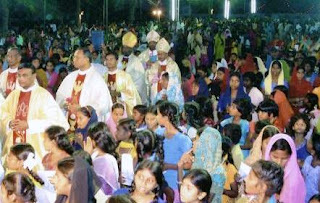 Still, he sees the fruits of his labors, supported by the Propagation: a recent parish celebration was attended by not only forty three Indian Bishops and priests but also 8000 local parishioners! Our Monthly Donors helped to make this celebration happen! As an added “Thank You” to our regular donors, we are adding another facet to the Monthly Donor program to honor a great figure from our history in the Archdiocese of Boston: Richard Cardinal Cushing. Known around the world as the “Mission Bishop”, Cardinal Cushing was instrumental in bringing missionary orders and speakers to Boston so that we could learn about the work of the Church in faraway places. Our Cardinal Cushing Club will bring together our regular donors for prayer and fellowship, and to learn more about the ongoing work of individual missionaries. Our first event will be on October 24, 2010 -- World Mission Sunday. Celebrated in every parish in the world on the same day, World Mission Sunday brings together our Mission Family: cultural and ethnic communities represented in the Archdiocese of Boston gather around the table of the Lord for Mass and to honor the missionaries that brought the faith to their homelands. Watch this space for details! For information on how to join the Cardinal Cushing Club and become a regular Mission Monthly Donor, call 617-542-1776 or email us at info@propfaithboston.org.